BLOG | Synconics Technologies Pvt. Ltd. Develop your content marketing strategy Simply sit down and be start writing. Odoo Blog will allow you to get started in no time. Our easy-to-use drag & drop feature will give you a blog with attractive design that’s mobile-friendly and looks great out-of-the-box. Visualize as you type: Odoo's unique 'edit inline' approach makes creating a blog surprisingly easy. No code required, what you see is really what you get. Building blocks system: Create your page from scratch by dragging and dropping pre-made, fully customizable building blocks. Easily put floating image inside your text block. Get a website with modern design in seconds. Categories & Tags: Allow people to browse through categories and tags: help people find the content they are looking for more quickly. Authorship: Easily select the name of a co-worker to grant blog post authorship. 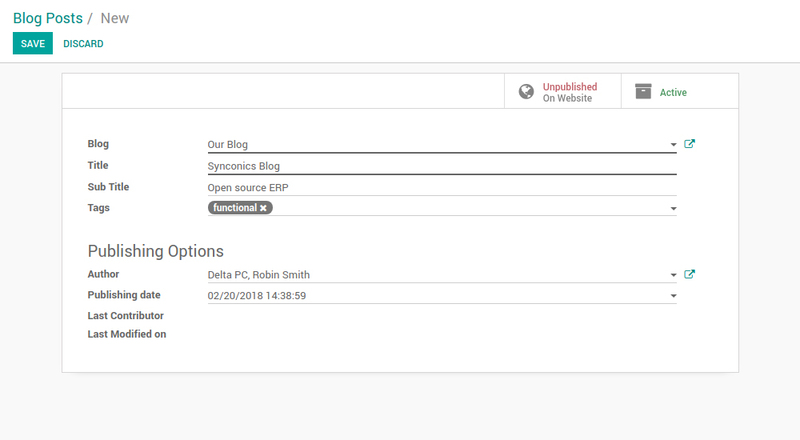 Bootstrap themes: Embed your blog in your Odoo CMS website and easily design your own Odoo templates thanks to a clean HTML structure and a bootstrap CSS. Fluid grid layout: Odoo CMS building blocks use a responsive, mobile-friendly fluid grid system that allows you to create the best layout corresponding to the devices on which the website is displayed. Multiple pages version management: Save and manage multiple versions of a page in a single space. Automated translation: Get professional standard translations using professional translators. Odoo will update any edits you make to your master page in your website’s other languages. Live chat embedded: Provide your visitors with information in real time directly on your website. No need for special chat servers as a pop-up chat window appears on the screen as soon as someone visits your website.